ASH Alum Ariane Nalty '94 talks about her exciting career in television. ASH Alum Colleen Waguespack '92 talks about how to balance family, faith, philanthropy and your career. The Rosary Alumnae Association, founded in 1913, was the very first in the Network of Sacred Heart schools, even pre-dating the Associated Alumnae of the Sacred Heart (AASH). Being an ASH Alumna comes with benefits that last a lifetime. Stay connected by joining the Rosary Sacred Heart Alumnae Association. The purpose of the Association is to promote the interests of the Rosary Academy of the Sacred Heart; to strengthen the bonds of friendship among Association members, the religious and the faculty; and to foster the ideals developed under the educational system of St. Madeleine Sophie Barat by supporting the goals and criteria of Sacred Heart education. For more information about the AASH, click here. Who can join the Rosary Sacred Heart Alumnae Association? Graduates of the Rosary are automatically enrolled upon graduation. Associate alumna are encouraged to join by contacting the Director of Alumnae. A member is in good standing when she has paid annual dues of this Association. We have more than 3,000 living alumnae with nearly 1,500+ members in the NOLA area, so the possibilities for social, professional and intellectual growth are endless. Where are member dues used for? Member dues support Alumnae Association activities and programs that contribute to the life of the school and personal growth of alumnae and students. Allow the Alumnae Association to host events throughout the year such as Alumnae Induction, Easter Egg Hunt/Blessing of the Babies, Young Alum events, and Feast of the Sacred Heart. Cardinal Pride: Reminisce and boast, ASH is still the most sought after school in New Orleans and one of the Sacred Heart Network’s oldest schools producing monumental contributions to all-girls independent Catholic education. Our Alumnae Association membership ensures Sacred Heart’s continued success and keeps you connected to all of our great achievements. Stay Connected: Stay connected to your Alma Mater. With subscriptions to The Bridge magazine, the Heartbeat newsletter and our Alum eHeartbeat digital newsletter, you’ll learn about upcoming events in your area and the latest news and topics impacting the campus and the world. Christmas Baskets: Provides hundreds of local families with meals while working with students to provide a community service. Alumnae Scholarships: Provides financial awards to students each year to support their academic achievement. Campus Access: Enjoy access to all alumnae events and tours of the new updates to our beautiful campus. Please mark you calendar for our open Board meetings. Networking: Network personally and professionally with other Sacred Heart alumnae at career and social activities. Meet alumnae in your area and those who share common interests. 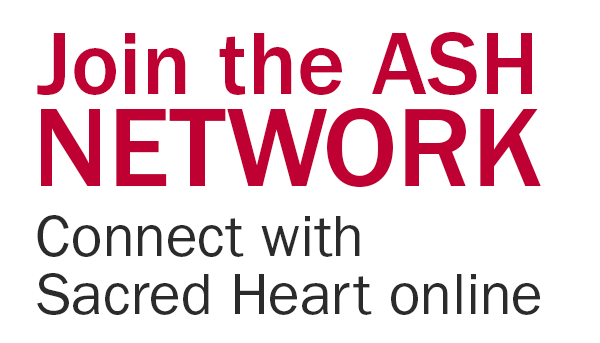 The Sacred Heart Alumnae Association expands your connections. Travel: Explore the world and visit other Sacred Heart schools internationally. Get your passport from the Alumnae Office to see Mater at the Trinita dei Monte in Rome or at Montmartre in Paris. Scholarship: Support the association’s oldest program. Alumnae Scholarships award thousands of dollars annually in merit and need-based scholarships to students. Need to update your Alum contact info? The alumnae association commemorates many of life's special events through it's Memorial and Tribute Fund. The alumnae association coordinated the effort to restore the chapel organ. *Plus, your membership dues may be fully tax-deductible. Have a question? Want to volunteer? When is Alum Weekend? Just ask.